At Liz Moore & Associates, we understand how to leverage technology to deliver an extraordinary real estate experience to our clients. We've made a significant investment in groundbreaking Matterport technology, so that prospective homebuyers can have an immersive online experience, giving them a true sense of the feeling of our listings before they ever visit in person. Navigate a property like a video game with Inside View and see how each room fits together using Dollhouse View. Understand layout in a glance with the top down Floorplan View. Being able to offer a compelling online experience to buyers who are outside the market enables us to create immediate, lasting emotional connections to our listings because they can experience it as though they were really there. 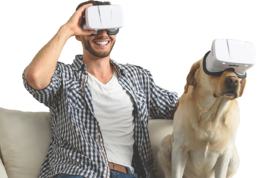 The 3D images are easy to share, so anyone with a computer or mobile device can have the open house experience from anywhere. For more information or to tour one of our listings in 3D, visit www.lizmoore.com/VR. Grilling is great but preparing and cooking your entire meal outdoors is even better! 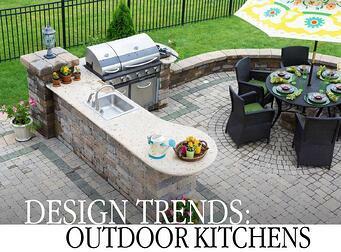 Outdoor kitchens are trending, here's what you need to know to create an outdoor kitchen of your own. Outdoor kitchens are growing in popularity as homeowners seek to add value to their homes by creating more functional space, like an outdoor kitchen. Kitchens have become the hub of the home and outdoor kitchens are an extension of that trend where the family can gather outdoors. Outdoor kitchens allow for prepping, cooking, enjoying, and cleaning up to happen in one place outdoors, no more trips back and forth from the kitchen to the patio. With outdoor kitchens, everything you need is outside, so you can enjoy your gathering as much as everyone else is. Cooking outdoors also reduces the heat indoors. Stovetops and ovens can make your home uncomfortably warm and make your air conditioning system work even harder. Shifting some meals to outdoor kitchens allows for lower cooling costs and increased comfort in your home. Some kitchen features are easier to add to outdoor kitchens than they would be to an interior kitchen. If water features, fire pits, or even a pizza/baking oven are things you'd like to enjoy, your best bet is putting them outdoors. Outdoor kitchens can include elements like grills, side burners, sinks, refrigerators, food prep stations and counters, drawers and storage spaces, griddles, bar and beverage centers, trash and towel drawers, vent hoods, stone ovens, and more. Traditional outdoor kitchens are comprised of a masonry base tied in to the style and exterior of your home with either brick or stone. Contemporary outdoor kitchens are characterized by sleek lines and polished finishes like granite and stainless steel. Whatever your style and preference, there are endless options to customize your outdoor kitchen and make this extension of your home your new favorite spot. Whether moving into a new home, selling your home, or maintaining your existing home, landscaping can add wow-factor and curb appeal to every home. It can often be overwhelming and confusing, so we’ve outlined a few tips and tricks from the pros. Create a drawing of your yard and plot out your master plan for your landscape. This may look intimidating, but just work in phases or sections focusing on small projects that are part of a bigger picture. This will help keep your budget in check and keep the project moving along as well as provide you with a sense of accomplishment and confidence. So how do you design your landscape? Before designing your landscape, consider a few questions- Do you have children that will play in your backyard and how much space do they need? Do you want to grow vegetables or fruit? How much time and motivation do you have to devote to maintenance? Do you have rabbits or deer that are eager to munch on your new landscape? Answering these questions first will help you define your needs and wants in a practical way, and second help you select plants and flowers that will perform best in your yard. It’s important to know how much sun the area you’re landscaping gets, and not only how much, but what time of day the sun is on that area. Many plants and flowers have very specific sunlight needs and tolerances that must be taken into account when designing your landscaping. For example, afternoon sun is much hotter and tougher on plants and flowers than morning sun. If you have an area that gets afternoon sun, it would be wise to choose heat-tolerant flowers like hibiscus and lantana, these will tolerate high temperatures and dry conditions while still providing vibrant color. Wind whistling around the corner of your home will quickly extinguish a fire pit. By studying your landscape’s wind patterns you can decide the best place for your fire pit or outdoor fireplace if you choose to include one. Any good garden design has a focal point, or series of focal points, whether it’s a statue, fountain, fire pit, stunning tree, or beautiful series of shrubs or flowers. The point is to draw the eye and move it through the landscape design. 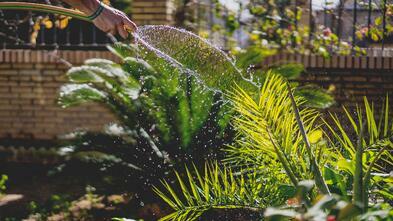 This is the most difficult element in landscaping design, but scale and pace give your landscape a cohesive look. Using variations in size, shape and color will lead people through the space. Place tall plants and shrubs in the back or up against a building, and then medium size, and finally ground cover in the front. Repeat some elements, whether it’s a certain plant, common color, or shape, to add a sense of cohesion. But to avoid monotony, add an occasional element that’s different but still complements. When planning your landscape, include elements that will wow in various seasons, so your landscape always looks appealing. For example, include perennials like an evergreen that produces berries in winter along with spring blooming bulbs and summer blooming bushes paired with inexpensive annuals for every season. This is a great way to ensure there is always something beautiful in your landscape. Edging creates a defined, finished look to your landscaping including your flower beds, driveways and walkways. You can use brick, stone, or natural material like plants. Natural edges are especially beautiful and form the lowest tier of your landscaping design. Low-maintenance perennial plants are ideal for this job like hostas or annuals like impatiens in shady spots, or perennial yellow alyssum flowers or annual zinnias in full sun locations. Design ways to hide your AC unit and trash cans. These things are necessary but can be quite the eyesore. Build lattice around your unit or cans and have ivy or climbing summer blooms like clematis or mandevilla decorate it, or plant shrubs to hide both. Pavers, gravel, pebbles, bricks, and more material are popular choices to build pathways through your landscape for high traffic areas. This will protect your lawn and add visual interest at the same time. Landscape lighting is aesthetically pleasing as well as a safety feature making sure paths and features are visible after sunset. Twinkle lights in trellises or strung in ornamental trees can add beauty and whimsy, while path lighting leads the eye through the landscape and has many designs and options to choose from including solar lights! The most important thing to remember is to be patient and flexible. Your landscape project is not a 3-day HGTV makeover, those shows have crews of 60 or more skilled workers and professional designers with years of experience. Take it slow and accept that some changes might need to be made season to season and year to year until you get your landscape just right. It’s a process, get outside and enjoy it! Attention House Hunters: The Liz Moore Summer Open House Extravaganza is Back! Calling all house hunters! Visit a Liz Moore open house between May 19th and September 1st, 2018 and you'll be entered into a drawing to win some amazing prizes. House hunters can register for the drawing at every Liz Moore open house. The more you visit, the better your chances are of winning! Click below for a list of open houses and to view complete contest rules.